Israeli Breakthrough at the United Nations! After nearly sixty years of membership at the United Nations, the Israeli government passed its first-ever resolution at the General Assembly's Second Committee, which deals with development issues, on a topic unconnected to the Arab-Israeli conflict or the Holocaust – and without a single opposing vote, at that. The tally: 118 states favoring the resolution, 0 opposing, 29 abstaining. With the exception of South Africa, those abstentions were from Arab- and Muslim-majority countries. Afghanistan and Pakistan voted in favor, however. 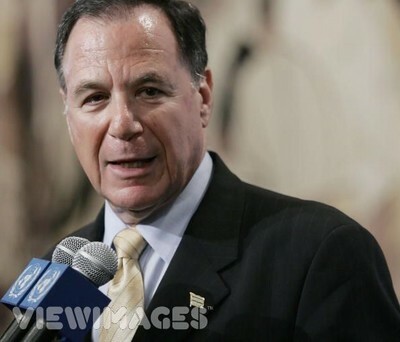 Dan Gillerman, Israel's UN ambassador. Following the passage, Israel's UN ambassador, Dan Gillerman, called "This first, historic Israeli-initiated resolution adopted by the UN … a signal of Israel's exceptional contribution to the world." He also gave a press conference where he called the passing of the resolution by the Second Committee a "very historic day for Israel." Mansour said Israel was "trying to score political points" and had rejected a move by others in the committee to have the motion presented by the chair as a consensus resolution. He said the Israeli action only emphasized "the divisions between Israel and the Arab countries," in contrast to the spirit of the recent peace conference at Annapolis. Comment: What in the world is Mansour talking about?